Keeping time. Photo by Egan Snow. Though Marin has done a really fine job with what bus resources it has – indeed, its service puts Washington, DC’s suburban service to shame – it doesn’t do justice to its geographic blessings, or the transit-oriented towns it serves. To get Marin on the move, GGT should reconsider the basic structure of its service. The ideal transit system is a grid of high-frequency corridors. Though it requires transfers, if the bus or train comes every five minutes it’s not that much of a problem. San Francisco, Vancouver, and even Tallahassee , Florida, have designed highly successful transit grids. Alas, Marin’s valleys preclude development of a high-frequency grid. Instead, our geography is in a trunk and feeder system. Just like the streams that made our valleys all fed into the Bay, our feeder roads all lead to the Highway 101 trunk. Only two town centers, those of Novato and San Rafael, fall along the trunk, and the rest are at least half a mile up the valleys from the freeway. Though not ideal, this system gives us a number of advantages. Foremost among these is that our trunk is a freeway. From an urban design perspective 101 is atrocious, but from a speed perspective this is wonderful. Unlike surface streets that require constant stopping and going and cars parallel parking and red lights and pedestrians and all the other nonsense that makes buses drive slowly and a city worth living in, a freeway is empty of all but cars, freeing drivers to push their buses far beyond their normal surface speed. As well, bus stops are relatively infrequent, only as often as an on- or off-ramp, so they don’t slow down the bus much. Secondly, our branches aren’t twisty little things that look great only on a drafting board. There’s not enough room for that. Instead, we have fairly linear arterials along valley floors with towns positioned right along them. Even sprawling Novato has only a couple of real arterial roads. Most anywhere you want to be is within a half-mile of these roads. Lastly, nearly all our local buses intersect the trunk. There are very few valleys coming off of valleys like Sleepy Hollow and Sun Valley to muddle things. This means that one could run a bus along the branch from one end to the other and always, either at the endpoint or the midpoint, there will be a transfer to a fast north-south line, which where the real distance is in the system. Sonoma, also part of the GGT system, doesn’t have quite the same linear structure as Marin, but the county’s principal town centers lie along 101 and so are similarly well-served (in a manner of speaking) by the freeway. As an added bonus, our towns are compact. Walkable destinations are easy to find, and office parks are clustered. San Francisco isn’t too far away, sitting at the base of our trunk, and the East Bay is easily accessible from Central Marin. While our bus lines generally follow this system, the trunk lacks true high frequency. A common complaint among commuters to Marin from San Francisco is the awful northbound frequencies. All three all-day routes – 70, 80, and 101 – leave at the same time from the City, and each is a different level of express. 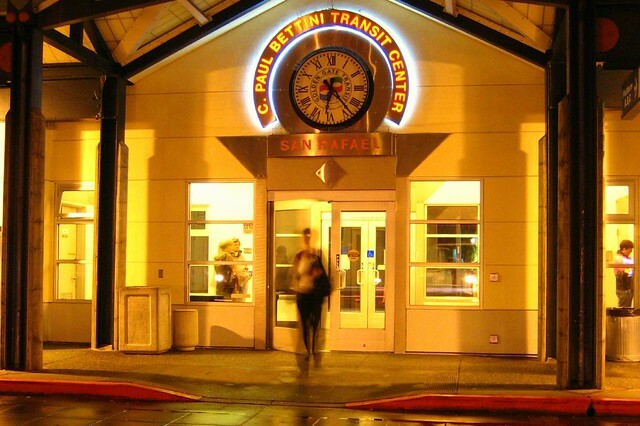 Within Marin, wait times are inconsistent, fluctuating between 6 minutes and 30 minutes for most of the weekday. In Sonoma, GGT runs consistent, though infrequent, one hour headways. Golden Gate Transit and Marin Transit should set a goal of no more than 30 minutes between San Francisco and Santa Rosa, and 15 minutes between San Francisco and Novato. This minimum level of service should go from 6am to 9pm weekdays and 9am to 9pm on weekends, roughly when service levels drop off in the existing service. The weekday service works out to about 268 revenue hours – 97 hours for the Novato-SF route, 171 hours for the Santa Rosa-SF – about 83 hours more than GGT currently runs. Weekend service would need 214 hours, about 62 more than currently available. According to GGT’s latest operating reports, our weekday service increase would cost about $3.3 million per year, and the weekend would cost $1 million, increasing annual operating costs by 6%. It may be possible to roll some commuter bus service into the morning schedule to decrease costs as well, which may go into an express service like what the 101 and 101X do now. Revenue from congestion pricing on the Golden Gate Bridge, as well as general toll hikes to bring them in line with transit fares, could easily cover the cost. This is a bus network, not simply a bus line, and we ought not forget about the feeder lines. Of the feeders, the most prominent are those centered around San Rafael’s Bettini Transit Center. 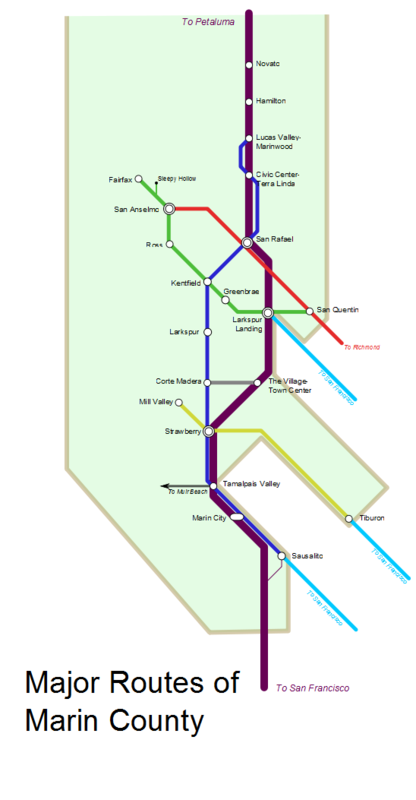 Not only do they have cross-platform connections (to borrow a rail term) to 101 bus service, but they serve the most densely populated areas of Marin – Ross Valley, Central San Rafael, and the Canal – and the East Bay. These should be high priorities, with a minimum combined headway of 20 minutes on each axis. The Canal, which already has 15 minute headways, should maintain them. Other valleys should seek minimum headways of 30 minutes between their town centers and the freeway. North San Rafael and Hamilton have uniquely transit-unfriendly designs but the bulk of Marin’s population could be well-served by semi-frequent service along valley-floor arterials. Just as important as frequency are the connections between 101 and the local feeders. Bus pads are typically awful things, and some routes – such as Tiburon’s Route 19 – don’t even connect well with the bus pads that are available. GGT and Marin Transit must push for stairs, better shelters, paved paths, clear signage, and onramp underpasses to facilitate transfers between local feeders and the 101 trunk as well as to surface streets. They should design each interchange as a single transfer area and provide maps for each, similar to the Larkspur Ferry map (PDF). Improvements like this are sometimes provided already, but should be standard. Though luxury isn’t necessary, customers should be comfortable when transferring and when waiting. That is the glue that makes the network really hum. You’ll notice I haven’t touched on density, signal priority, BRT, SMART, or the speculative Fairfax-San Rafael streetcar. While each of these things could dramatically improve service along the 101 corridor, they aren’t necessary to make a successful system. Using the infrastructure we have today it’s possible to make a high-class transit system for the North Bay. GGT should focus on network-wide improvements, and the key to a better bus system lies along Highway 101. GGT wants a better bus line to the East Bay, but unless it learns the lessons of the 101 it will remain an underused connection for the region. Quietly, Golden Gate Transit has begun to unofficially examine improvements for Routes 40 and 42, the two bus lines across the Bay to Richmond and El Cerrito. Though it hasn’t been asked to by MTC or Marin Transit, GGT believes the lines could do better than they have and want to speed up the connection for cross-bridge commuters. Not only are they not express – both buses plod along local Marin streets before the bridge – but they’re not branded for East Bay service. To seriously rework East Bay service, GGT should approach the problem by learning from Route 101 and give the East Bay a fast and frequent Route 580. The three concepts of routing, frequency, and speed are interconnected. Where a bus goes lengthens or shortens its route, making it faster for riders and cheaper for transit agencies as fewer buses are needed to maintain a high frequency. Ridership data for the 40/42 corridor shows only four major stops: the Transit Center, Point Richmond, Richmond BART, and El Cerrito del Norte BART. The Route 580 should only make stops here, as well as one stop in downtown Richmond – if the city will ever become vibrant, the renaissance will start here. This routing means a speedy trip along Highway 580 and the Richmond-San Rafael Bridge without dealing the plodding pace of Marin’s surface streets. A round-trip should take a bus less than an hour and a half, meaning 30 minute headways are possible with only three buses running the route. Though on the map it makes sense to go straight to El Cerrito del Norte, Richmond is a much more heavily-used station than Del Norte. It slows down service a bit, but nearly as many people use Richmond (158 boardings/alightings per weekday) as Del Norte (243 boardings and alightings per day). Cutting out the Richmond station would isolate a densely populated part of the city and force riders to or from there to take BART or AC Transit at either end of their journey. It would also isolate any Amtrak commuters that don’t want to park in the East Bay. A second, local bus would take over the current Route 40. Though slower, it would service Anderson, East Francisco, and Cutting. Marin Transit has a stake in keeping that line running, even if the line doesn’t perform well, to provide transit service for those areas that otherwise would go without. The route number 580 is absolutely important to promote ridership in the car-centric counties of Marin and Contra Costa. Route 101 has been a smashing success not only because it operates as a reliable express to San Francisco but because of its branding. Unlike the other links to the City (routes 10, 70, and 80) even the most casual transit user can guess that the 101 goes on the freeway to San Francisco and back again. The branding also properly evokes the kind of feeling one gets when driving on a freeway: you’re going somewhere, and you’re going there fast. In this case, the destinations are Amtrak, BART, and, most importantly, Richmond itself or, from the East Bay, the very center of Marin’s bus system. The current branding and routing of the 40/42 feels like a shuttle service, a Band-Aid reminding riders that a better transit system is just across the Bay, if only they’ll use it. Sometimes, branding can make or break a product, and this is certainly true when wealthy Marinites will take inconvenient but luxurious transit (the ferry) instead of convenient but less-luxurious transit (the bus). If you’ve ever watched Mad Men, you know how advertisers (fictional ones, at least) take a great deal of time to come up with the proper brand for a product to convey the intangible emotions that go with it. GGT should absolutely drop the 40/42 designation for 580. The East Bay is Marin’s second-largest source of workers, and they work all over the county. The East Bay is also a destination for a great deal of Marin’s commuters, and access to BART is vital to the health of the county. Access to world-class transportation systems deserves a world-class response. A 580 express bus is just the way to provide it.